Instructions 1- Select a function 2- Use the sliders to see how a, h and k change the parent function into a transformed function. Pay attention to if a, h and/or k is positive, negative, greater than zero or less than zero etc... Hint: Change only one value at a time to see its influence. 3- After you explored the transformation of these functions, and drew your own conclusions about the what a, h and k do to the parent functions, answer the questions below. Hint: When you select a new function, place a = 1, h = 0, and k = 0 to see the effect of each parameter by separate. 1) Using the quadratic function a) Where in the function does the value of a appear to be located? Write the equation of the function using a. b) The value of a, does three different things to the functions. What are they and for what values of a, do they occur? 2) Using the absolute value function a) Where in the function does the value of h appear to be located?. Write the equation of the function using h. b) The value of h can move our graph in two ways. Which ways does it move our graph, and for what values of h causes these movements? 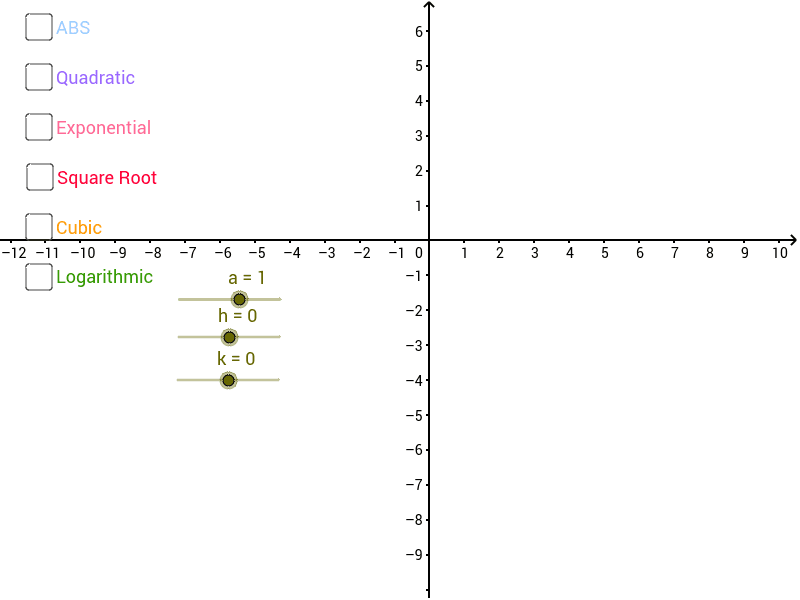 3) Using the square root function a) Where in the function does the value of k appear to be located? Write the equation of the function using k. b) The value of k can move our graph in two ways. Which ways does it move our graph, and for what values of k causes these movements? 4) Write the equation of a cubic function that was flipped, translated 3 units left and 2 units down.